I have A LOT of series that ended last year that I resolved to read in my Gone with the Year post. So in this one I’ll include other books that I’ve had for a while that I WILL read this year. In fact, my main resolution is to read mostly books I own! 1. Harry Potter – I’ve only read the first book, but this year I plan to read more of the series, if not all. 2. The Host (The Host #1) by Stephenie Meyer – Oh, yes! Before I watch this movie, which looks awesome, I will finally read this book! 4. High Fidelity by Nick Hornby – This is one of my favorite movies, partly because of John Cusack, I’ll admit, so I bought the book but have yet to read it. I will get to it this year! 5. Sunshine by Robin McKinley – If there is one vampire book I must read this year, it is this one! 6. Dreamland by Sarah Dessen – It’s the only Dessen book I have yet to read, and it’s because I’ve heard it’s sad…but I’ll brave it this year! 7. Darkfever (Fever #1) by Karen Marie Moning – I want to meet this Barrons finally!! 8. The DUFF by Kody Keplinger – I know so many people love this book and I’ve had it FOREVER! I will read it! 9. Endless Summer (The Boys Next Door #1-2) by Jennifer Echols – This will be the year of The Echols Awesomeness! She has, like, 4 books coming out this year!! And I plan to read them all and this one! 10. The Complete Jessica Darling Series: Sloppy Firsts, Second Helpings, Charmed Thirds, Fourth Comings, Perfect Fifths by Megan McCafferty – This might be cheating, BUT I DON’T CARE! THIS IS HAPPENING!! Dash and Lily is really good! Its very Christmassy so might be a good read for end of the year! You definitely need to read the harry potters!!! I’ve made a note to read Dash & Lily this December! :D And I will! I will read the Harry Potters!! I hope you love the Fever series! It is amazing! And yes yes yes for Harry Potter! Truth? I love JE but did not like Endless Summer. In fact, I couldn’t finish it. But I am excited about Jen’s new books this year + also, whoa, you are going to get such a rush reading Jessica Darling :) Happy new year, my dear! I just finished The Host yesterday (after seeing the preview) and I loved it! Much better than what I thought. I just totally pictured the scenario you’ve laid for read HP and I want that NOW! LOL! 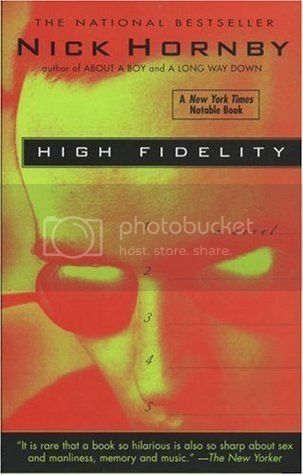 I liked High Fidelity — I read it in college and thought it was quite good. I WILL!! I will do it for you! :) And me too a little bit.